A relentless litigator and savvy business advisor, Mr. DeWeese is equally at home in the courtroom and boardroom. He handles complex civil litigation in state and federal court, as well as employment and civil rights issues and insurance coverage disputes. He has litigated in complex arbitration proceedings as well as other forms of alternative dispute resolution, and represented clients before administrative bodies and other state and federal governmental entities. As the founder of the Oregon Cannabis Law Group, Mr. DeWeese is on the forefront of the novel legal issues concerning the emerging cannabis industry, and represents and advises cannabis business clients on state law compliance and licensing issues. Mr. DeWeese has received several professional acknowledgements, including being listed as a Rising Star by Super Lawyers in Florida in 2012, 2013, 2014, and in Oregon in 2016, an award, bestowed on less than 2.5% of attorneys, which honors both the recipient’s skill as a practitioner and their commitment to the highest levels of legal ethics and professionalism. Mr. DeWeese was also named a Legal Elite “Up and Comer” by Florida Trend Magazine in 2011. Mr. DeWeese is a member in good standing of the Oregon and Florida bars, as well as the bars of the United States Supreme Court, the United States Eleventh Circuit Court of Appeals, and the United States District Courts of and for Oregon and the Southern District of Florida. 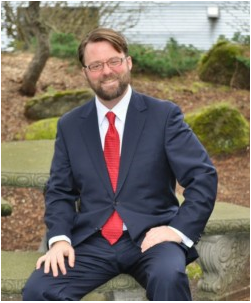 Mr. DeWeese has served on the Judicial Screening Committee of the Multnomah County Bar Association, and is a proud founding officer and member of the Cannabis Law Section of the Oregon State Bar. Mr. DeWeese was born and raised in Port Townsend, Washington. In his spare time, Mr. DeWeese enjoys exploring the Pacific Northwest, reading, and adding to his extensive rare book collection. Mr. DeWeese is also a professional-calibre orchestral violist who has toured and concertized throughout Europe and the Americas with some of the most prominent classical and popular artists of our generation. His primary instrument is the “Eclipse” viola, commissioned by Mr. DeWeese and crafted by the luthier Thomas Gaetano Sparks.